Margaret Wooding Baker has been named the new dean of USF’s School of Nursing and Health Professions (SONHP) after a national search. “Maggie is dedicated to teaching, scholarship, and public service, and this was essential as we selected our new dean,” said Donald Heller, provost and vice president of academic affairs for USF. 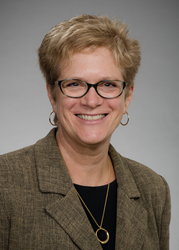 The University of San Francisco (USF) has named Margaret Wooding Baker dean of the School of Nursing and Health Professions. She will lead a team of more than 100 full-time faculty and staff, and serve as a member of the university’s Leadership Team. Baker will begin her role as dean in late August. Baker comes to USF from the University of Washington in Seattle, where she is the associate dean for academic affairs and an associate professor in the Biobehavioral Nursing and Health Systems department in the School of Nursing. She worked previously for the State of Washington as a senior health policy analyst, is a member of the state’s Nursing Action Coalition, and is past president of Washington’s Council on Nursing Education. This year, Baker will complete the Executive Nurse Fellows Program, a prestigious, three-year executive nurse leadership program sponsored by the Robert Wood Johnson Foundation to help identify solutions to the country’s most pressing health issues. Baker holds three nursing degrees: a Ph.D. from the University of Washington, an M.S.N. from Otterbein College in Ohio (administrative track), and a B.S.N. from Russell Sage College in New York. Baker’s research interests and community work center around elder abuse and mistreatment. Other passions include quality improvement, leadership, and advances in nursing education. USF selected her following a national search. USF’s School of Nursing and Health Professions enrolls approximately 825 undergraduate and 750 graduate students in 11 academic programs, ranging from public health and health informatics to nursing leadership and clinical psychology. U.S. News and World Report rated its clinical nurse leader graduate program one of the best in the country in 2016, and the school offered California’s first doctor of nursing practice degree (DNP) in 2006. For more information and to request an interview with Dr. Baker, please contact Anne-Marie Devine Tasto, USF senior director of media relations, (415) 422-2697 or abdevine(at)usfca(dot)edu. The University of San Francisco is located in the heart of one of the world’s most innovative and diverse cities, and is home to a vibrant academic community of students and faculty who achieve excellence in their fields. Its diverse student body enjoys direct access to faculty, small classes and outstanding opportunities in the city itself. USF is San Francisco’s first university, and its Jesuit Catholic mission helps ignite a student’s passion for social justice and a desire to “Change the World From Here.” For more information, visit http://www.usfca.edu.